Belgium’s number one DJ MAKASI has been making a lot of noise both in Europe and the USA with a strong back catalogue of superb mixtapes. Now he teams up with UK Rapper CONMAN from the infamous WOLFTOWN RECORDINGS label for a special mixtape that will be released in Belgium, France, and Holland & Germany which is sponsored by www.sturbanclothing.com. DJ MAKASI superbly mixes the tracks with an excellent display of mixing, chopping and blending. Featuring a barrage of unreleased tracks and collaborations this audio journey profiles one of the UK’s hardest-hitting MC’s brilliantly. It’s something for the streets and is the perfect tonic for those fans of CONMAN waiting for his debut mixtape release with BIG SKEEM (TEAM AFFICIAL) entitled ‘Hustler’s Edition’ as part of the ‘Extended Family’ series by TRICKSTA on the WOLFTOWN RECORDINGS imprint. 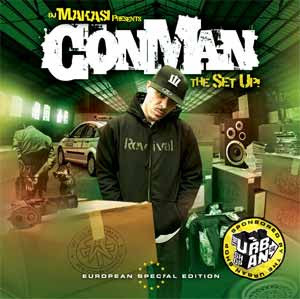 As part of VICIOUS CIRCLE and WOLFTOWN COMMITTEE, CONMAN has stamped his name firmly in UK Hip-Hop history, but in 2008 we are going to be seeing a lot more of CONMAN. With his eighteen track debut album ‘The Life & Grime Of Conman’ due later this year big things are in store for CONMAN.